Excited about having seven days off for Guoqingjie (the holiday of the Republic), I decide to organize my trip along with a friend: I go to the ticket office and ask the agent to book two tickets for any destination in Inner Mongolia worth visiting. I take the pink tickets that are still warm from the printer and read 鄂尔多斯 (Ordos). 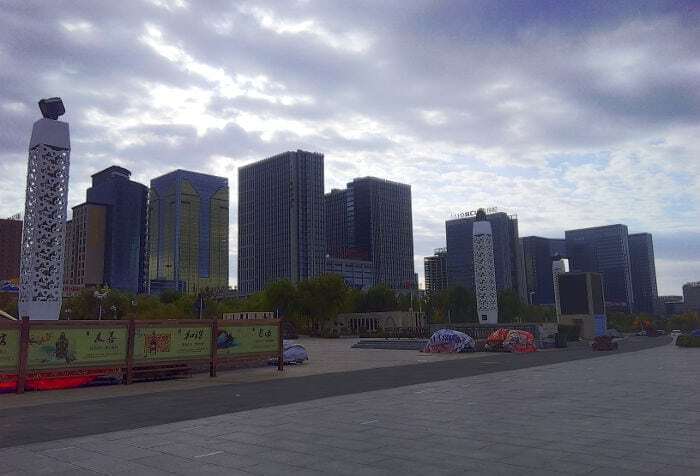 Ordos is a city in Inner Mongolia, surrounded by desert. The number of its inhabitants is uncertain because different sources give different numbers. According to a census in 2010, the number would be 1,940,653 inhabitants (source). But the most widespread information associated with this place is the term “ghost city”. Curious yet frightened at the same time, I soon discover what this term refers to: Ordos is a “deserted” city, when compared to the large Chinese Metropolises. Large projects accompanied the construction of this city, which in fact is characterized by enormous modern buildings built all over the city, which are, for the most part… empty! Despite this, Ordos is often known as the “Chinese Dubai”. You can get to Ordos by train or by air. 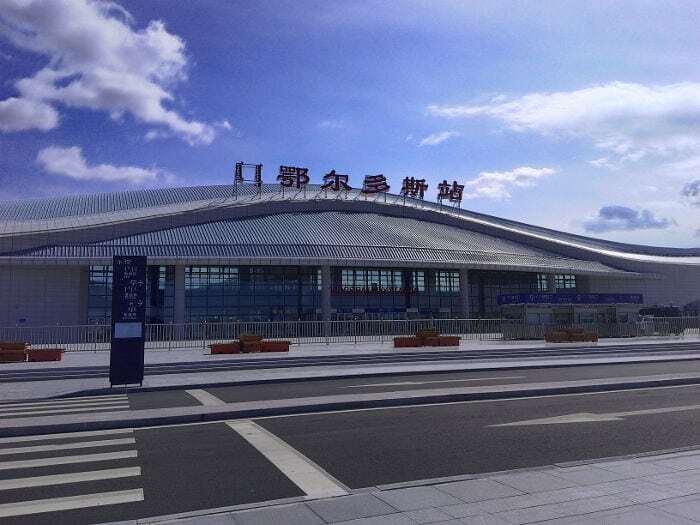 Though the locals don’t seem to know this, there are two railway stations in Ordos: 东胜西站 (Dongsheng West Station), and the very new (and deserted) 鄂尔多斯站 (Ordos Station). Ordos’s airport, is located to the south of the city in the Dongsheng district. Arriving in Ordos, the first impression you have is that you’re not in China. Not in the noisy, crowded large cities of China at least. As soon as we leave the station we ask for information on how to get to a nice area to look for a hotel, and so we find ourselves on a bus that brings us to the long distance bus station (长途汽车站), where we get off and start looking for one. The location, as we discover, is strategic for getting around. Rather taken aback by any type of logic or orientation, we begin wandering around the city, backpacks on our shoulders, looking for a place to deposit them. The first thing we notice is how clean everything is. There may not be too many people on the streets but the cleaners are certainly not missing. They pick up papers or gather what little garbage they find along their path, while not missing their chance to speak to waiguoren, foreigners, when they see one (and I get the impression that this is a rather rare occurrence, having seen no one else during my stay). Not only are the streets clean but they’re orderly! The sound of a siren is an unusual sound in this bizarre place where the cars stop at the pedestrian strips and let people pass and the electric motorbikes, tricycles, carts and bicycles are no longer too common. Looking down isn’t the only joy: raising our gaze we see an intense blue dusted with fluffy white clouds. We can now enjoy a bit of fresh air and breathe in fully. Despite it being a Chinese national holiday, when traveling and finding a place to stay isn’t all that simple, we decide not to book in advance, confident that the city would be empty enough. The reality doesn’t disappoint our expectations, but that’s not why finding a hotel is so easy. We go into several places and the result is always the same: they don’t accommodate our request because we’re foreigners. Some tell us outright, others imply it and yet others try to come up with unconvincing excuses. However they are all happy to point us to a pair of international buildings where foreigners are welcome, paying between 700 and 1000 Yuan a night. We decide to keep looking for a “Chinese” solution, accompanied by an adorable little man who, seeing our discomfort, has one of his goons follow us on the search. Exhausted under the weight of the backpack and the continuous walking, we finally enter into a hotel where nobody asks us anything. All we do is hand over our passport and we get a spacious room with two double beds (for just two guests), and a full en suite bathroom with a broken handle. All in all the room is clean, functional and comes with Wi-fi. And all at the modest cost of 88 Yuan a night. You can also find a hotel in Ordos through Booking or Agoda (hotels that only accept Chinese citizens are marked), remembering to specify if you’re a foreign citizen so as not to find and unpleasant surprise upon arrival. Click here to find all you need to know about booking a hotel in China. The main attractions to see in Ordos are the desert, the grasslands, the Genghis Khan Mausoleum, and the Ordos Museum. Resonant Sand Bay is kind of a resort built in the desert, a recreation area designed for adults and children. 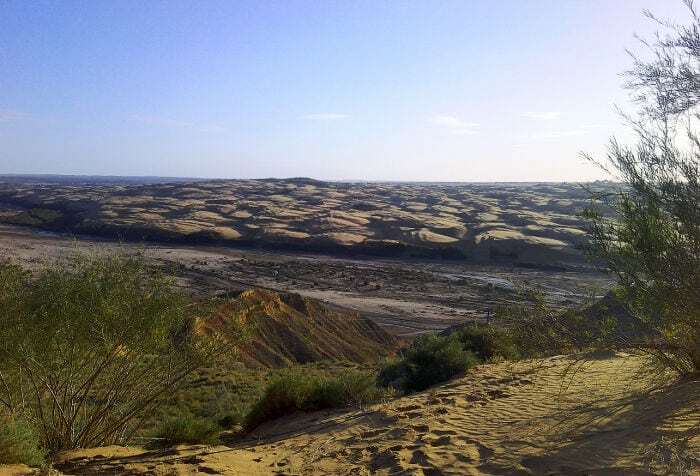 Upon arriving here, besides enjoying a spectacular walk in the desert, you can also lose yourself in the tourist attractions: riding on horseback or on a camel, sliding down the dunes, Jeep or quad tours, archery or swimming in the pool. You can also spend the night in a yurt (the typical Mongolian tents), enjoy a magnificent starry sky, song and dance shows, attend a typical Mongolian wedding ceremony and finally taste local products. It is said that on the driest days it’s possible to hear harmonious sounds produced by the sand dunes. Numerous legends are associated with these sounds, such as the most popular story of a Lama’s temple buried in a sandstorm. The audible melodies in this desert would therefore be the eternal songs of the Lamas’ souls. According to a local, however, it hasn’t been possible to hear these wonderful sounds for some time, especially since construction has started to sprout up in the area. How to get there: At the long-distance bus station (长途汽车站), reachable by bus 23 from Dongsheng West Station, you can find the highway bus station. Get a ticket for Xiangshawan (响沙湾), and get off at 达旗. From here proceed on foot or by taxi for 3 km until you reach your destination. It takes about 2 hours to get there. To get a break from the huge buildings of Ordos, you can go to the grasslands, where all you’ll see is grass, Mongolian tents, and animals. Here too you can explore numerous attractions and recreational opportunities intended for tourists, such as spending a night in a tent, admiring songs and dances, tasting local delicacies, going horseback riding or trying archery. It’s important to choose a good period for visiting the grassland so as to enjoy the beautiful green color of the grass. How to get there: From the same highway bus station, get a ticket for Hangjinqi （杭锦旗). Once you get there go by taxi for 9 km until you reach the grassland. Travel time is about three hours. It seems that Genghis Khan found the lands around Ordos so beautiful that he decided to be buried here after his death. Though there’s some uncertainty as to whether or not his remains are the ones preserved here, the mausoleum is still considered a sacred and highly valued symbolic place for the Mongolian people. Inside the three pavilions shaped like yurts you can see paintings of the great conqueror’s life, as well as everyday objects and the sarcophagi of his wives and other members of the family. How to get there: from the bus station ask for a ticket for the Genghis Khan Mausoleum（成吉思汗陵 – Chengjisihan Ling). The Ordos Museum was built in the new area of Kangbashi which hosts, among other buildings, the center of art and culture and the library. The Kangbashi district is the political, cultural and financial center of the city. Walking through this neighborhood you can taste the hoped-for glory of the area that was sadly never realized. Large streets, shopping malls, enormous residential buildings, banks and cultural institutes are there, ready to host an excited crowd that has never reached their destination. The streets are deserted and the buildings are empty. Kangbashi is a symbol of the deserted city: when night falls, lights illuminating apartments are still rather rare. Yet the construction hasn’t stopped and the city remains an open construction site that continues preparing itself for a prosperous destiny whenever (or if ever) it arrives. 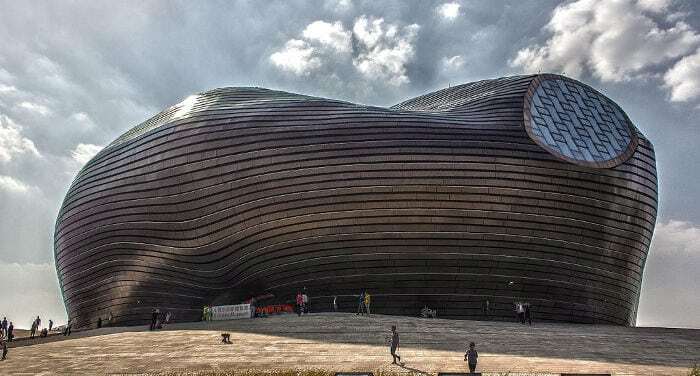 The Ordos Museum is a rounded structure, covered by aluminum plates that cover almost 41 thousand square meters of surface and goes up for six floors. This museum celebrates the history, art and culture of not only the city of Ordos, but the entire Mongolian people. You can find everyday objects, reproductions of scenes of domestic life and all sorts of useful information on this civilization. How to get there: take buses numbers 1, 21 or 22 and get off at the stop 文化艺术中心. Before heading back to the station to leave this land of contradictions, we decide to take a little time to peacefully walk the streets around our hotel and taste or buy some local typical products. All we see are new buildings and empty streets. So let’s move on to the food! Typical products of this region are dairy products with a meat base. The Mongolian population prefers meats like mutton and beef, which is sold fresh after cooking, and vacuum sealed is edible even months after buying it. But the true culinary revelations were the dairy products which are so difficult to find in China. After some searching we found a store selling dairy products where we were able to buy yogurt, milk and fresh cheeses. Our eyes light up upon entering the shop, and the moment is immortalized by a series of ten year old paparazzi that show up out of nowhere. We continue tasting, trying sweet and salty cheeses, cheese sandwiches, fresh butter and other fresh products. There’s also the fake leather canteens filled with naijiu, a milk-based Chinese liquor (which to me seems a worse version of baijiu). We leave the shop with a bag full of groceries and the owner’s eyes still sparkling. And at this point we’re ready to leave Ordos. You burn bright with hope. You live in a joyous arc of optimism, a rhapsody of can-do spirit. Not just you. Daily, earnestly, together, we plot human uplift. We teeter on the brink of bliss and then, splat, we land in its creamy centre. Plug the words ‘utopian’, ‘Malthusian’ and ‘dystopian’ into Google Ngram, and see. Use of the word ‘utopian’ has risen markedly since the 1920s. It levelled off in the 1970s, then has been rising, sometimes steeply, since the mid-1980s. In contrast, the dismal word ‘Malthusian’ barely exists in Google’s ‘lots of books’. And ‘dystopian’ has risen only slightly since 1970. True in English, the pattern is similar in Italian, French and German. So, if you’re reading this with ease, according to Google, you’re obsessed with utopia. Or maybe it’s the case that, since the 1980s, we’ve been obsessed by utopia’s absence, using a hopeful-sounding word to mark our sense of loss. Thomas More’s Utopia was published in 1516, just over 500 years ago; 250 years later, in 1766, Thomas Robert Malthus, author of An Essay on the Principle of Population (1798), was born. More and Malthus, and their works, have become so significant and symbolic that people talk about them without knowing exactly what they’re talking about. Frequently, ‘utopianism’ now implies the improvement of our condition while ‘Malthusianism’ means the opposite: doom. Many people have used ‘Utopia’ (originally in Latin), ‘utopian’ (coined in 1551) and ‘utopianism’ (1649) to describe societies they’d like to live in ­– or that seem too good to be true. For not quite so long, ‘Malthusian’ (1805) and ‘Malthusianism’ (1833) have described societies in which most people would rather not live. (In 1868, John Stuart Mill proposed ‘dystopian’ to describe the kind of person who planned utopia’s opposite.) Yet the men were larger than their reputations. More was more than slightly dystopian. Malthus was not above suggesting how to improve society. At one level, they were engaged in a common project: each attacked what he regarded as the misplaced optimism of his contemporaries. Utopianism and Malthusianism are not just synonyms for optimism and pessimism. They stand for divergent views of whether the obstacle to increasing human happiness is human nature, or rather the rest of nature. More thought that humans were the problem. Malthus acknowledged the problem of humans, but concluded that material nature itself presented a greater impediment. Today, we live in an odd moment. Both More’s pessimism about human nature and Malthus’s pessimism about nature itself reign, but few want to admit it. The UK and US voting publics have responded to promises to restore some past greatness – utopias for some, consequent dystopias for others. In fact, most people in either nation (or beyond) prefer to outsource their small measure of utopianism not to politicians but to technical experts, the folks who make matter, non-human nature, serve humans. These technocrats include the computer wizards in Silicon Valley who run Google, which can record our chatter about utopias, but not our suppressed Malthusian worries about human life on the planet. We want to live in futuristic betterment but at the same time dread being shot back into premodern bare want. For every promise that some place can be great, there is a parallel claim that if some people are not excluded from it, the greatness will falter and fail. Somehow, the greatness is finite. To see human nature and the rest of nature as out of sync is important – if done consciously. Today it is easy to find repudiations of neoliberalism, the doctrine, ascendant since the 1980s of Margaret Thatcher’s UK and Ronald Reagan’s US, that private activities produce public good and personal happiness more effectively than any public investment or oversight. Nearly 40 years on, we finally query the wisdoms of a neoliberal society. But without knowing exactly what it got wrong, it’s impossible to do better. The Tudor humanist More and the Regency clergyman Malthus, of all people, can help us. They are experts on our moment. Together, their key works turn a spotlight on the much disparaged, pre-neoliberal 1970s, when things could have gone differently. The 1970s represent the last serious discussion of whether and how humans can manage the rest of nature for the greater good. We need that forthright mix again, bitter Malthusian tea served, nevertheless, with a sweet lump of Utopia. ‘Moral philosophy’ sounds like a mirthless business but, conceived (correctly) as the branch of human knowledge specialising in happiness, it has greater appeal. More and Malthus were moral philosophers, two of the specialists in ethics who ponder the criteria for human happiness. What is it? Who has it? What are its true manifestations versus its false appearances? How much of it is there and how far may it be spread? Which versions are unjust to some if desirable for others? What materials are necessary to make and maintain it? More approached these questions from traditions of religious exegesis and humanism. Malthus operated within the newer dictates of political economy, originally a branch of moral philosophy because it proposed that economic activities could make people happy. Like us, More and Malthus lived through crises of accelerated societal debate and change. Such historical crises are occasions to stress-test old definitions of happiness and propose new ones. The Reformation made many people giddy with new possibilities but More never lost his head, except he literally did, by opposing them. In an era teeming with proposals for radical transformation of faith and life, he was orthodox. Yet as Utopia makes clear, More knew that people hankered for new worlds. The book begins with a real person, Thomas More, meeting a made-up person, the sailor Raphael Hythloday, who describes a distant island with marvellous laws and customs. The story within a story resembles accounts of the places that contemporary European mariners were describing. But good luck finding Utopia. The island lies far away, More says, vaguely. When told its exact location, he cannot hear the specifics above the racking cough of another sailor who has been wrecked by seafaring. It’s a double warning against the quest for the perfect human community: you can’t get there from here, and the voyage might kill you anyway. But you will still want to reach Utopia. It is full of wonders. It is a republic, a commonwealth, the non-monarchical social unit central to Western debate over human society since Plato’s Republic. Utopia’s social life is communal. Property is held in common. People switch houses every 10 years, lest they get attached to them. There is no private – all aspects of life are visible to all, monitored by all. ‘The whole island is like a single household.’ Distinctions according to wealth are banned. People are pious, most belonging to the same religion, though other faiths are tolerated. The astonishments pile up. Utopia’s courting couples see each other naked, a kind of premarital caveat emptor. Then divorce is permitted anyway. Women as well as men may be priests. But no one can be a lawyer, Utopia has none. Happy yet? If all else fails, euthanasia is available. Many, many people have found Utopia appealing. Catholics and Communists alike have cited it to support either conservative Christian or revolutionary socialist ways of life. Obviously, these aren’t easily reconcilable social models. Which did More mean? Probably neither. ‘Utopia’ is famously two-faced. The Greek-based neologism can mean ‘good place’ (eu topos) or ‘no place’ (ou topos). The Greek-inflected surname of More’s sailor-informant, Hythloday, customarily translated as ‘Peddlar of Trifles’, also discourages confidence. Scholars continue to build up their resumes by arguing over whether More wrote a prankish satire or a piece of serious political philosophy. We know he set his face against the English Reformation in particular, including Henry VIII’s repudiation of his marriage to Anne Boleyn and break with the Roman Catholic Church. More is an unlikely advocate for divorce, or for religious toleration. The book is practically a guide on how to mock the social revolutions of others. Yet one critical economic element – More’s concern over inequality of wealth – runs steadily and convincingly through his work. He deplores the new English practice of ‘enclosing’ the countryside, fencing it off to breed sheep for the profitable foreign wool market. The sheep ‘swallow up people’ because they graze land that once fed humans. And significantly, More thinks poverty results from human greed, not natural limits. English people starve in famines while food is hidden away in ‘the storehouses of the rich’. Meanwhile, in Utopia, people know that ‘Nature … like an indulgent mother, has placed all wholesome things, like air, water and earth itself, within our reach’ while hiding within her the glitter of jewels and precious metals. Utopians make gold and silver into chamberpots. They produce far more grain and livestock than they can consume, and sell the surplus abroad. Population never outstrips what the land can feed. Utopia’s towns have an optimal size: 6,000 households with no more than 10 children apiece. Surplus kids are redistributed into smaller families so they aren’t neglected. Whenever population exceeds these measures, people are chosen to go colonise ‘redundant and untilled land’. Hoarding vacant land is grounds for war – it’s pointless greed, when the island produces so plentifully for its big, happy household. In contrast, Malthus was wary about Mother Nature. He aimed his Essay on the Principle of Population against his generation’s utopians (in the unsatirical sense), the partisans of revolutionary upheaval in France. Malthus thought that their plans for total societal overhaul suffered from a fatal flaw: ignorance of natural limits. He claimed a twinned law of nature. Human increase proceeds geometrically (1, 2, 4, 8 …) while agricultural resources can increase only at an arithmetic rate (1, 2, 3, 4 …). Therefore, the population will always tend to exceed the food supply, and thereafter people will suffer famine and disease. They will resort to violence, including infanticide, abuse of women and children, and war. Societies were destined to oscillate between surges and declines, reducing human happiness to a miserable, recurring confrontation of scarcity. There seemed no escape. The Reverend Malthus could not condone artificial birth control (which his Church of England did not sanction until 1958), instead condemning the ‘vicious’ practices that prevented conception or birth. For Malthus, ‘misery’ and ‘vice’ were humankind’s options. In the second, expanded edition of his Essay published in 1803, he extended those bleak prospects across the globe. He wanted to make his principle of population universal, itself a natural law. From the Eurocentric travel literature of the time, he extracted and embellished dire scenarios of hunger. The Iroquois, he claimed, made war on their neighbours both to drive them away from precious hunting territory and to slay them as edible prey. ‘Let us go and eat that nation’ was the Iroquois call to arms. Malthus did not reject the possibility of societal improvement. Eventually, he proposed a kind of solution to misery or vice: ‘moral restraint’, meaning the delay of marriage and sexual abstinence within it. He advocated restraint especially for the rich, who then as now consumed the lion’s share of resources, but recommended punitive treatment of poor people who had large families. He criticised European population growth because it led to the colonisation of other peoples’ land. And he proposed raising the social status of the ‘old maid’, as a woman who renounced love and marriage was ethically superior to a woman who married and had children. But it’s not obvious that Malthus was always entirely serious. Did he really think that Regency spinsters would become figures of admiration? That the Iroquois routinely dined on people? That the agricultural improvements in his day – or the future – would never boost the food supply? Or were these provocations more thought experiments, not unlike those enacted on More’s odd little island? Basically, More and Malthus present two big ethical claims: greed is not good, and nature is not boundless. Their two claims challenge the classical liberal political economy and politics that emerged after More’s lifetime and during Malthus’s. They afford alternatives to the better-known Marxian critique of liberal capitalism. Crafted in the 16th and the 18th centuries, the utopian and Malthusian proposals are distant mirrors in which modern people of the global West have seen themselves, sometimes more clearly in one, sometimes in the other: utopian, Malthusian, utopian, Malthusian. To see ourselves in both is the biggest challenge. Hard as it is, such power of sight is what we need – and it’s what we’re trying to achieve, though not always consistently and coherently. Consider a recent utopian success: granting lesbian, gay, bisexual, transgender and queer (LGBTQ) people full civil rights. A generation ago, San Francisco, before it was an expensive annexe of Silicon Valley, was described as a utopia for gay people, or else as a gay ghetto, a self-quarantine station. No longer. Much of the urban global West now resembles San Francisco, where LGBTQ people can live openly without being designated as criminals or second-class citizens. The progress falls short of a full revolution, and it doesn’t exist in most of the world: 74 countries still criminalise homosexuality, including Russia and much of Africa and the Near East. Even where it’s legal, to be identified as LGBTQ often leads to stigmatisation, harassment, assault. And all of these might yet increase. Gender conventions are stubborn. So is racism. The Black Lives Matter movement states a goal – to make US law enforcement recognise blacks as the equals of whites – that should not in 2017 be utopian, but is. The Black Lives Matter slogan is also technically Malthusian, a comparison of some human lives against others. And because the incidents of police violence that elicited the movement occurred after the financial crisis of 2007-8, Black Lives Matter is Malthusian also in identifying the persecution that comes with constrained economic circumstances. Attacks on historically racialised individuals elsewhere have shown that the problem is global. If there are die-hard utopians among us, they tend to be of a kind More and Malthus disregarded: architects and engineers, people who think very concretely about physical stuff that might make life better for everyone. They are even more utopian than the Utopians, who didn’t seem to build much, and they are definitely less Malthusian than Malthus, whose views of agriculture were implicitly skeptical of the possibilities of human craft. Engineers are perhaps the greatest utopians. It’s not a designation always bestowed on Elon Musk and Mark Zuckerberg. But their efforts to put electric cars on highways, to make drones expand internet service, to get people to Mars (and back? ), claim to be works on humanity’s behalf. Musk and Zuckerberg defy More’s warning about accumulating wealth. But they and other engineers have invented utopian options, even unintentionally. For the millions of us who use social media for fun, there are thousands of refugees who need it to map a way out of hell. Log on and enjoy the pop-up ads – you’re subsidising freedom, validation that the global West is still, for a great many people, positively utopian. The dark side, laid bare in the 2016 US election, is the bubble effect of new-media news networks. Here the net tradeoff (migrants’ self-emancipation versus voters’ self-willed ignorance) is not reassuring. Of course, the sages of Twitter and Facebook think they can fix that. Whatever the lures of greed, engineers set out to build better worlds while working for government and universities, not just themselves. The US Department of Transportation, for example, has been a major innovator in alternative fuels. It currently works with the US Department of Agriculture to develop biojet fuel. Some academic geoengineers are trying to correct for the carbon emissions responsible for global warming. Since 2010, the University of Oxford has run a Geoengineering Programme. One of its cooperative efforts, Stratospheric Particle Injection for Climate Engineering, experiments with particle emissions that could shield Earth from solar radiation, preventing the heating that will kill coral and melt polar ice, among other things. Whether these engineering fixes are utopian or not depends on one’s definition of the word. Geoengineering invites accusations of moral hazard, ethically dubious reassurance that humans can continue to put carbon into the atmosphere because a specialised subset of them might clean it up later. Malthus’s warning that nature has only so much to give still stands, as does his doubt that specialists (in his era, farmers) can work only so fast to prevent some doom. In any case, it’s notable that, while the public might be uncertain whether scientists are their friends and guardians, they tend to like applied science. No big ideas about nature, please – but happy if you can make it do our bidding. Nor is covert Malthusianism a problem only among fringe groups that grump darkly on the far edges of the internet. In 2016, three anti-immigration groups joined Earth Day Texas celebrations. They insisted that conservation of natural resources required stabilising the population by cutting back visas for foreigners and increasing spending to ‘secure the border’. In the UK, the Brexit campaign decried the country’s compliance with EU policies by, among other things, using a photograph of a seemingly endless stream of refugees, a visualisation of material invasion. Though of course not wholly diagnosable in environmental terms, responses to the refugee crisis constitute our era’s most obvious Malthusianism. The implicit worry is that there isn’t enough to go around. Overtly, covertly, that dread of too many people informs how policy is made, who wins elections, what can be said in public, and in turn how we think about the world, what we can even imagine about it. We globalists might be optimists, but only of a dystopian kind. Mirrors from the 1500s and 1700s rarely survive intact, but they still reflect back on the world. Fragments of utopianism and Malthusianism have been reassembled into the equivalents of disco-era glitter balls. As they torque overhead, they spray hopeful light, if only in tiny bits. The 1970s were the last time people displayed the combination of dystopian optimism that reigns today. Malthusianism loomed in public discussions, yes, but alongside faith in human liberation. Paul Ehrlich’s ThePopulation Bomb (1968) had shrieked that millions of people in the ‘Third World’ were about to die because they were outbreeding resources. Ehrlich’s Chicken-Little prophecy, which dominated pop culture at least through the cinema release of Soylent Green (1973), is one reason why ‘Malthusian’ now signals racist paranoia and isn’t present in Google’s ‘lots of books’. Terrorism, environmental degradation and economic stagnation were also common concerns of the 1970s. But so were women’s liberation, gay liberation and black liberation. The mishmash helps to explain the cognitive mismatch of the decade, in which people who were inclined to dance did so, happily, to disco anthems that, with surprising frequency, celebrated mere survival: You’re stayin’ alive, stayin’ alive … I will survive … Keep yourself alive. Keeping alive was a joyous act. Despite the dire lyrics pounding within them, discos were wholly, unsatirically utopian. There, black and Latinx musicians could perform, LGBTQ people could dance, women could assert selfhood. Meanwhile, Silicon Valley was shimmering into focus with the inventions of email (1971) and the home computer (1975), among other wonders. Small cadres of technocrats, those trained to make nature yield her treasures, were thus launching new hopes. From their dissident homebrew computer clubs, the geeks were reconciling nature with human nature, before there was any money, let alone big money, in doing so. They were utopians when personal computers were part of a counterculture, greenish alternative to corporate culture. The last days of disco, the 1970s, were the glorious times before the buzz of neoliberalism. Before greed was good and environmental limits were negotiable, people worried about staying alive and danced to ‘Stayin’ Alive’. Circumstances warned against the easy acquisition of happiness, yet people sought it, indeed, preached that it should be available to all. Now, nations, states, innovators and cultural leaders have accepted the dubious promise of neoliberalism, that to extract private wealth from everything is an excellent way of being. The good news is that the upcoming arguments – indeed they have already begun – about what to do next can do more than repeat the nearly parodistic Adam Smith-Karl Marx confrontation that has dominated for at least a generation. Multiple ideas are available to us. The religious traditionalist More warned that happiness could never be founded on private accumulation, but also that sailing straight away from that goal might land us on a tiny island of cumulative weirdnesses; the early political economist Malthus warned that happiness would fail whenever material abundance failed. I am not exactly happy that either of these moral philosophers turns out to be right, let alone that both of them are. But I take heart that there exists a big stock of ethical reflections – even beyond More and Malthus – that can help us plan better in future. So, wherever you find yourself in these early days of 2017, happy new year, and remember that strong tea with a lump of something sweet can help many a hangover. is the James Duncan Phillips Professor of Early American History at Harvard University. Her latest book is Round About the Earth: Circumnavigation from Magellan to Orbit (2012).